Ho Chi Minh City has some great vegetarian restaurants, so you won’t have any problems eating here if you’re veggie. These are our personal favorites. This is one of our favorite restaurants in Saigon, and one that we visit on most days. Lots of locals eat here, which is usually a good sign. The menu is fairly extensive and also reasonably priced. The food in the image above (Pho, Braised Tofu & Mushrooms, Rice and Fresh Spring Rolls) came to around VND 125,000 ($6, £4). The menu is in English, and most staff speak at least a little English, so you shouldn’t have any trouble ordering. This restaurant is on Le Lai, just across the road from the park. Address: 174/4 Le Lai, Ben Thanh, District 1, Ho Chi Minh City (look for the illuminated sign – the restaurant is at the end of the lane on the right hand side. This is another favorite of ours, and located in the backpacker district. This restaurant has an even more extensive menu than the one above, and also includes lots of Western food. The menu includes appetizers, salads, soups, spaghetti, backpacker favorites, pizza, noodles, hot pots, fried rice, Vietnamese soups, stir frys, braised dishes, pancakes, desserts, and drinks, including beer and wine. This restaurant is very reasonably priced, with main dishes costing around VND 40,000 ($2, £1.30). The staff speak fairly good English and are very friendly and helpful. Lots of Vietnamese people also eat here. This restaurant has seating for about 30-40 people downstairs, with additional seating upstairs. This is another restaurant in the backpacker district. Food is mostly Vietnamese, and dishes are similar to the ones at Quan Chay Yeu Thuong. This restaurant is set over three floors, with the first floor area laid out in traditional Vietnamese style, where you sit on cushions on the floor at low tables. We saw many restaurants in the backpacker district that had vegetarian options on the menu, so just keep your eyes open and you’ll find plenty of veggie food. 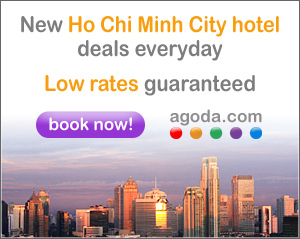 For a great selection of hotels at great prices, check out the Agoda link below.